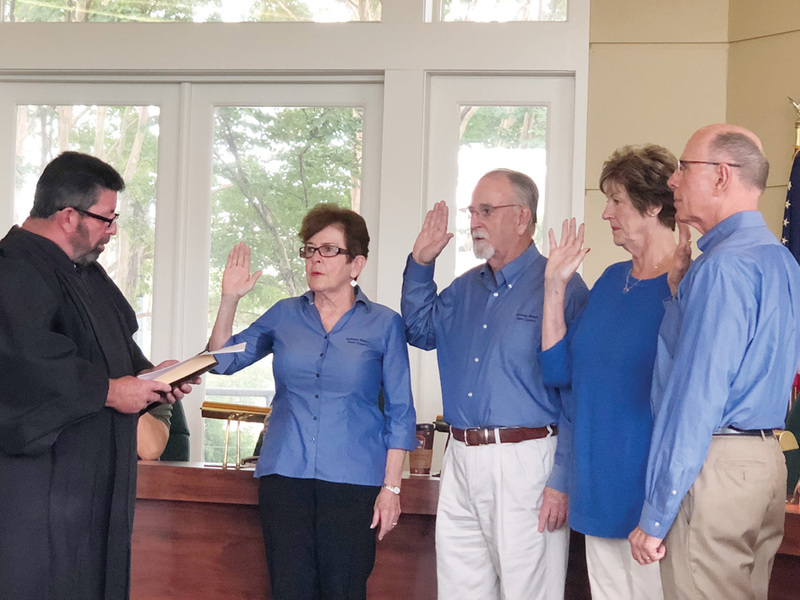 Bethany Beach Alderman Charlie McMullen, left, swears in (from left) Rosemary Hardiman, Lew Killmer, Faith Denault and Bruce Frye to two-year terms on Bethany Beach Town Council. The Bethany Beach Town Council was of one voice on Monday, Sept. 17, when they held their town council reorganizational meeting, appointing the mayor, vice-mayor and council secretary-treasurer for the coming year, as well as filling a seat on the Bethany Beach Planning Commission. Councilwoman Rosemary Hardiman nominated Councilman Lew Killmer — who has in recent years served as the Town’s vice-mayor — to become its new mayor, taking over for a retiring Jack Gordon, who left the council after 10 years. There were no other nominees, and the council voted unanimously for Killmer to take the council’s primary leadership role. Councilman Bruce Frye nominated Hardiman to fill the vice-mayor spot, again with no other nominees and a unanimous council vote to make it official. Councilman Jerry Morris was nominated to continue as council secretary-treasurer, and that, too, was confirmed on a unanimous council vote. The council in the coming year will continue to meet on what is generally the third Friday of each month, at 2 p.m.
With the council only having a non-voting liaison member on the Planning Commission, former commissioner Faith Denault vacated her spot on the commission on Monday as she took the oath of office as a new council member. Killmer, who had also previously served on the commission before joining the council, will remain the council liaison to the commission. Taking Denault’s place on the Planning Commission will be Jim Sirkis, who finished fifth in the voting for the four spots available on the council in the Sept. 8 election. After the election, Sirkis had confirmed to the Coastal Point his intention to get more involved with the Town and its government. His term on the commission will run until Oct. 20, 2020. The council’s committee chair appointments were straight out of last year’s book, with Chuck Peterson leading the Audit Committee; Morris chairing the Budget & Finance Committee; Hardiman leading the Charter & Ordinance Review Committee; Carol Olmstead heading the Cultural & Historical Affairs Committee; Frye again heading the Fourth of July Parade Committee; and Killmer heading the Non-Residential Design Review Committee. All of the committee chair appointments were approved with a unanimous council vote. The council will hold its next regular meeting on Friday, Oct. 19, at 2 p.m. at town hall.